Finally, after years of thinking about making a piece for Sota (State of the Art Quilt) exhibition, I have done a piece and entered it this year. The juror saw fit to include my piece (thank's Lisa!) and today I thought I would share it with you all. 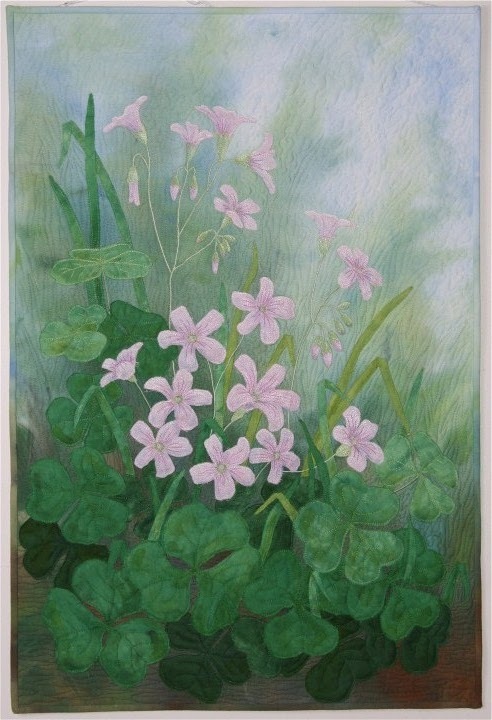 It's called Wood Sorrel, and well, pretty obvious from that title what it is! I found it growing in my large, neglected garden, and despite it being an introduced species turned feral, couldn't help but find it delicate beauty attractive. Some of my textile friends described the piece as "gentle", and I rather like that description. If you want to know more about Sota, check out the Queensland Quilters Art Quilts Blog which shows where and when the quilts will be on display.